The United Nations Military Gender Advocate of the Year Award recognises the dedication and effort of an individual peacekeeper in promoting the principles within the United Nations Security Council Resolution 1325. 2016 marks the first year the award will be given out. The selection process for a recipient began in 2015 when the Office of Military Affairs, which sits within the Department for Peacekeeping Operations (DPKO) in the United Nations, requested Force Commanders and Heads of Mission from all DPKO peacekeeping missions to nominate a military peacekeeper whom they felt had best integrated a gender perspective into peacekeeping activities. We hope the award will help raise the profile and understanding of what mainstreaming a gender perspective, within a military context, means for UN Peacekeeping missions. 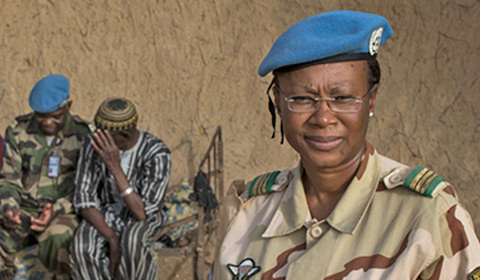 Major Aichatou Ousmane Issaka, a Nigerien officer, who served with our mission in Mali (MINUSMA) has won the United Nations Military Gender Advocate of the Year Award 2016. Major Isaaka stood out from her peers as an officer who consistently sought to integrate the principles of UNSCR1325 in to the daily work of her Force and Sector Headquarters. During her time with MINUSMA, she served as a captain in the civilian-military cooperation cell in the city of Gao. Much of her time was spent developing quick impact projects that aided the local population. She spent considerable time training fellow staff officers and reaching out to local women, thus strengthening ties between the UN and the host community. Major Isaaka also accompanied what would have been all- male patrols thus making them more approachable and accessible to the women and children in Gao. Major Isaaka is forty two years old and a graduate of social affairs from the Niger Military Academy. She is married with three children and lives in Niger’s capital Niamey.